Mama mia! That’s a spicy stereotype-a! When one wants to mock something online by pretending to overpraise it lavishly, only two words are necessary to get the message across: “chef kiss.” That’s enough to conjure the image of a prototypical Italian chef raising his fingers to his lips in a gesture of cartoonish delight, as if the thing being reviewed couldn’t possibly be any better. But where did this cliché come from and how did “chef kiss” become the exemplar of social media snark? Jay Hathaway has investigated this question for The Daily Dot and reports his findings in his piece “The Rich, Delicious History Of *Italian Chef Kiss*.” The answer turns out to be complicated: a mixture of actual Italian culture, American marketing, and the murky politics of Twitter and Reddit. 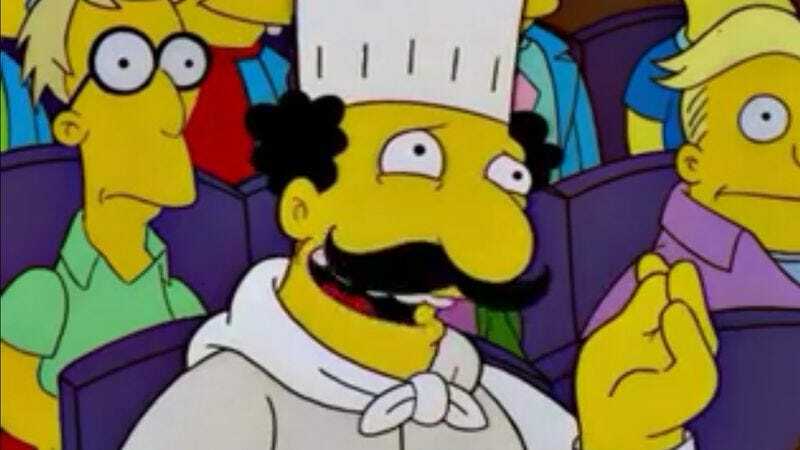 The Swedish Chef from The Muppet Show is also somehow involved, even though he’s patently not Italian. As Hathaway found out, there is a genuine Italian gesture that indicates “al bacio,” meaning “as good as a kiss.” So the chef kiss has some legitimate roots. But the stereotypical Italian chef, with his poofy white hat and twirly mustache, is largely the creation of post-World War II American advertisements. The article contends that the stereotype is now recognized worldwide. Good job on that, Madison Avenue. Oddly enough, the supreme example of this cliché, Chef Boyardee, is modeled after a real human being, Ettore Boiardi. As for the online ubiquity of the chef kiss, Hathaway blames the phenomenon on two inescapable images. One is of the Swedish Chef raising his thumb and forefinger to his pursed lips. This seems to derive from an advertising photo, featuring a version of the chef with articulated fingers capable of making the gesture. The fact that the Muppet appears to be sparking up a joint also contributed to the pic’s popularity. Apparently, there’s some online controversy surrounding such “poser” Muppets that can be used in upsetting and disturbing ways. But that’s a controversy unto itself. The other major influence on the chef kiss meme is an image known as “Discourse Chef.” The chef in this cartoon is winking and making an A-OK sign, but it still conveys the chef kiss message. That brings up another, related matter: Can the chef kiss be depicted through emojis? Thus far, the combination of a smiley face and an okay sign seems to be the standard, but there’s no consensus on the matter yet.